They came. They went. The house survived. So did our marriage, although it hit an all-time low about an hour before kick-off. My mother, who had done sterling, above-call-of-duty work all day with Harry (who opened his eyes yesterday in an absolute turd of a mood), successfully mediated a reconciliation by nervously proffering coronation chicken sandwiches. Bless her. Even across three large rooms, we were a bit crowded, as despite the eventual sunshine (FFS! ), the breeze on Hairy Farmer Hill was rather too brisk for outdoor partying. 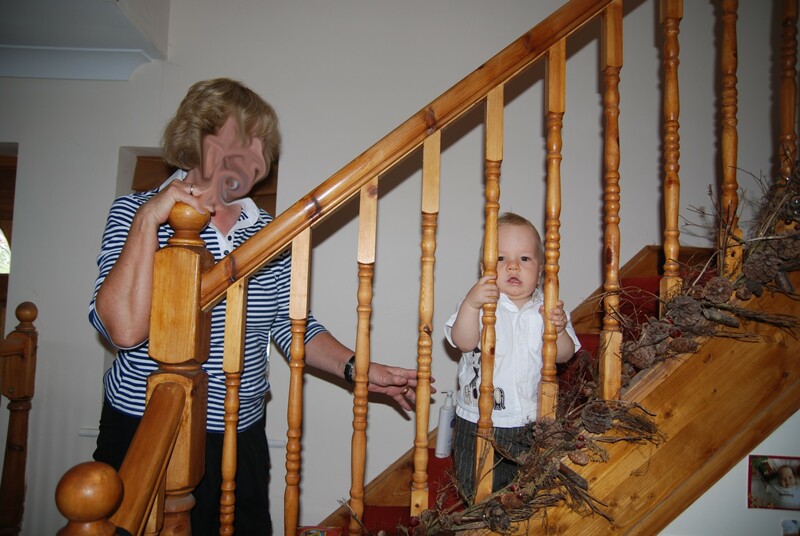 Harry spent most of the party alone on his new favourite toy: The Stairs. He has unfortunately sussed the downstairs geography now, and on Monday I will be buying another baby gate. Like a tiny yet intrepid mountaineer, he clambers industriously from step to step, patting each stair as he reaches it, stopping frequently to grasp and shake the bannisters whilst peering delightedly at how far he has come. The attractions of an inflatable castle and lots of little friends paled in comparison to the opportunity for mighty climbing conquests. Where is the cake? I hear you cry. Weeell, not my finest hour. 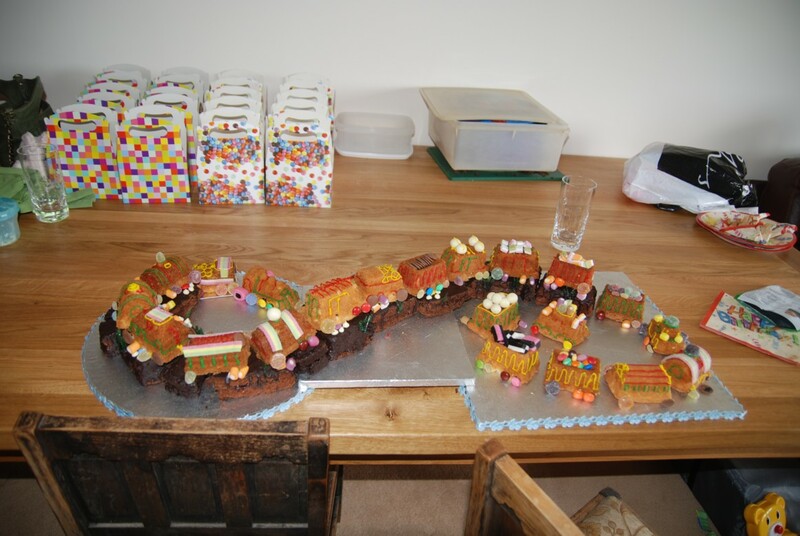 The carriages look ok, but for some reason I panicked and decided that they were too dry without a filling, so I added a chocolate sponge layered embankment at the last minute, and rather spoilt it. Everyone took a carriage home, so I will make him another for tomorrow afternoon. One with, like, his name on. Yep… managed to forget that element first time around! I bought a funky sparkler ‘1’ candle, but I’ve lost it. It’ll turn up in time for his tenth, I expect. In all, we had a lovely day. I am doing the same again with older friends and family tomorrow, although far lower key. It is nearly 10.30pm, and a year ago today I was probably just about getting my chops around some lovely gas and air. I’d arrived on the labour ward at 7pm in increasing pain, but with a uterus that disobligingly stayed soft at the top during my contractions, fooling Drs and sensor pads alike. There had been muttering about appendicitis and paracetamol, but when John eventually fetched the staff out of the shift-change meeting at 10pm to tell them I had now taken up moaning residence on the floor, someone put a glove on and had a look the old-fashioned way. 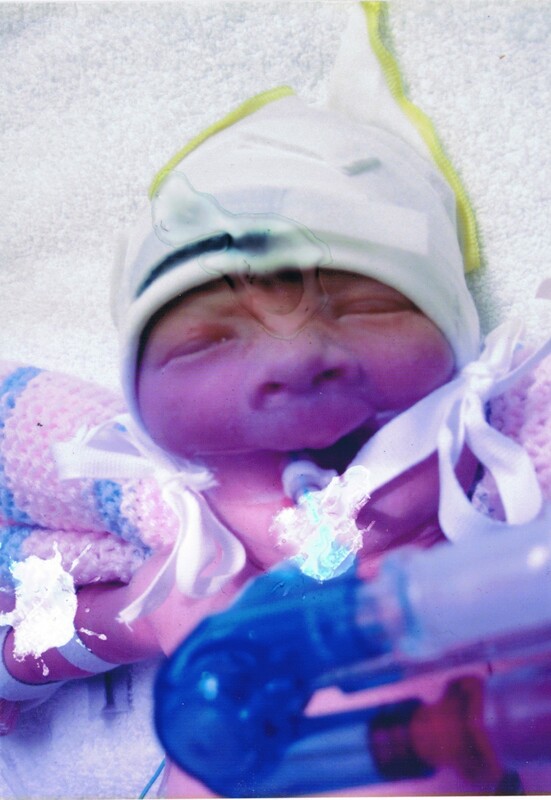 Harry was born blue, with the cord wrapped twice around his neck at 1.18am on the 3rd August. The labour was joyful, in a strange way. My body performed. There was pain, a very short period of agony, then a culmination, and then a great sense of wonder; that was all how childbirth is supposed to be. And then my baby disappeared. 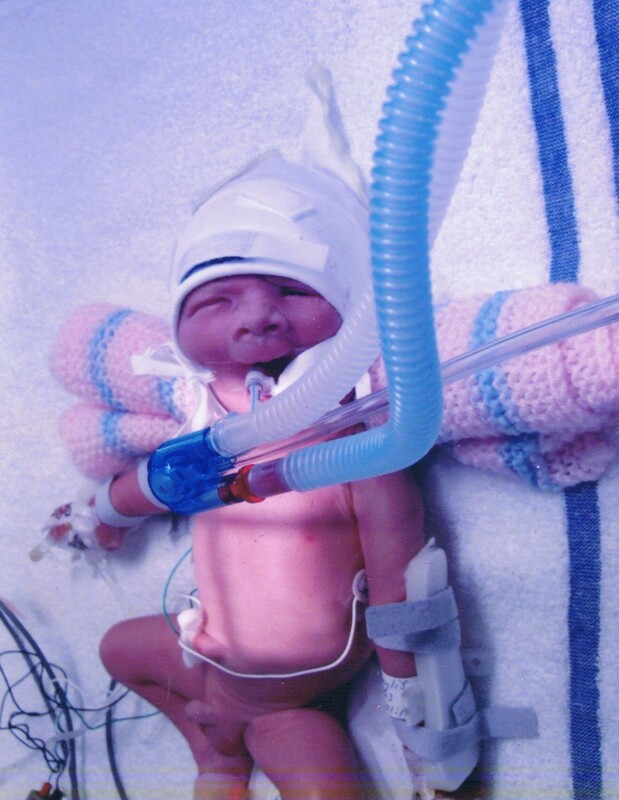 This was taken in his first hour of life, by a nurse with an under-performing camera. The smudging is where I later spilt water on the polaroid whilst trying to juggle a breast pump, the photos, and a glass of water. God alone knows why I was looking at these whilst pumping, they only ever made me freeze in fear and sob endlessly. His eye is open a tiny bit, and I was so mortally upset and afraid that he was in pain. One year on, and I cannot say that I am over the appalling trauma of his birth and first few days of life. The distress still floats to the surface extremely easily, along with stomach-twisting flashbacks. I actually feel that I will never fully recover from his arrival. But dear God, it’s worth it. And I shouldn’t complain. I would have died for my wonderful, precious son then, and I would a million times over now.